It began on a construction site while performing a plumbing job, my dad, Ray Terry, saw a guy with a bucket and brush putting tar on a basement wall, and thought 'this is really messy and slow and wondered why there wasn't an easier way to do this nasty job. So he began his search on nights and weekends, how to spray asphalt out of a pump, then scraped together enough money from his family to assemble his first asphalt spray rig. He then contacted several home builders in Cincinnati to apply damproofing to thier walls, of which they were all too happy to do, that was 1956. 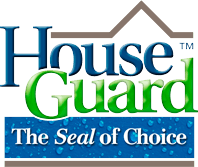 In 1995, I launched Houseguard waterproofing brand from our family business in Pavement Preservation Industry. Our experience in asphalts then about 40 years qualified us to produce a top quality waterproofing product. Our history as a family waterproofing business also gave us confidence that we understood the needs of contractors. We have come full circle, and today continue the family waterproofing legacy under the ownership of The Garland Company. Kim, is the founder, developer and the face of the Housegaurd brand product. His primarly role is to shepard the Houseguard brand, be a link between our customers and our company, and to expand our reach by communicating the Houseguard story through personal selling, our web site, social media, and printed materials. Kim, also is experienced in technical and trouble shooting aspects of the business. He is married to Pam with two grown children, no grand kids yet. He lives in Cincinnat and enjoys tennis, flying, boating in Cumberland , cooking and most recent experience is learning to kitesurfing in Aruba. Eco-Friendly Products That Create A Warm, Healthy And Dry Basement.